(Nanowerk News) Chemists at the University of Basel in Switzerland have succeeded in twisting a molecule by combining molecular strands of differing lengths. The longer strand winds around a central axis like a staircase banister, creating a helical structure that exhibits special physical properties. The results were published in the renowned scientific journal Angewandte Chemie International Edition ("Inducing Axial Chirality in a "Geländer" Oligomer by Length Mismatch of the Oligomer Strands"). The chemistry of all substances is to a large extent defined by their spatial arrangement. Many molecules can be present in two forms (enantiomers), which behave like a person's right and left hand. In particular, the organism makes a highly specific distinction between left- and right-handed molecules - a substance can, for example, be extremely active as a drug in one form, while its mirror image is entirely inert. The fundamental understanding of this "chirality", as it is called, has long been a central component of research in the field of chemistry. 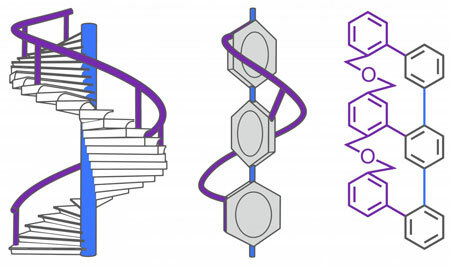 The researchers headed by Professor Marcel Mayor in the Department of Chemistry at the University of Basel have developed a new approach to contort a small molecule into a form similar in appearance to the banister on a spiral staircase. At the molecular level, the interlinking of two oligomer strands with different lengths forces to the longer strand to wind around the shorter on its own to balance out the discrepancy in length. This creates a helix with a uniform twisting direction. As a consequence the entire molecule becomes chiral. The researchers were also able to demonstrate that it is possible to dynamically change the form of the helical molecule from left-handed to right and back again in just a few hours. "It is not just the structural elegance of this molecule which makes it so unique," says Mayor. "Above all, it is a completely new way of constructing a continuous helix." Efficient procedures for creating chiral compounds generate much interest in basic research and the industrial sector - they can, for example, be used in biological systems research, crop protection chemistry, and the pharmaceutical and fragrance industries. The project was financially supported by the Swiss National Science Foundation.